I have some ambivalence about granola. It was among the grain-based inventions of the Victorian anti-libido campaigners before getting adopted by hippies who saw it as wholesome peasant fare. Later it was co-opted by food manufacturers and transformed into a sugary bit of fluff that capitalized on its formerly healthy image. Then its name was applied to gooey, icing-drizzled candy bars, and now it has become a too-convenient label for people like me who rinse their hair with kombucha. I would dismiss it entirely in favor of fried eggs and toast, but the fact is, sometimes on warm mornings I do want something crunchy to top with sliced strawberries and kefir. Granola is also the easiest cold breakfast cereal to make at home, and I’m a member of the generation that grew up with granola slowly baking in the oven. The smell, now, is wired into my brain, even though I disliked eating it then. I found it both gummy and tough -- a complaint that is still valid. This granola recipe is quite different. Yes, it’s still oat-based. But it soaks overnight in kefir and maple syrup, then gets slowly dehydrated in the oven until it gains a wonderful shattering-crisp texture. The soaking has some nutritious side-effects, too: the oats break down somewhat, making their nutrients more available to the body. Like most granola recipes, it’s quite adaptable. I particularly like it with pecans and maple syrup, but you can use molasses or honey as a sweetener, too. You can add dried fruit, spices, extracts, or citrus zest. I adapted this particular recipe from Cheeseslave. Line two baking trays with parchment and spread the mixture across them evenly. Set the oven to 175 degrees and try to arrange the trays so air can circulate around them. After 8-12 hours, the granola will be dry enough that you can lift it in pieces and flip it over. Let it finish drying another 4-8 hours, until completely crisp. Turn off the oven and let the granola cool down. 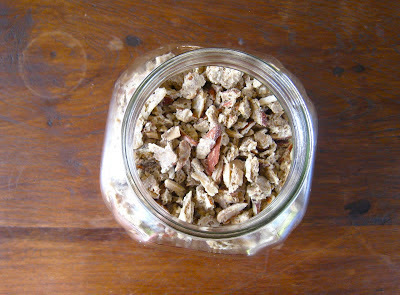 Crumble into small pieces and store in a sealed container. It keep nicely in a cupboard for a few weeks. *I prefer to use soaked & dehydrated nuts, as they're less heavy on the stomach. Soak a pound or two of raw nuts overnight in plenty of fresh water and a tablespoon of salt. Drain and rinse, then arrange in a single layer on baking sheets and either dry in the sun on a hot, clear day (bring them in at night so they don't get dewy), or dehydrate in the oven at 150-200 degrees until crisp. Love this! Have missed you. Please post (more) often! I made this, and while the flavor was good, I wasn't pleased with the texture. It was crunchy yes, but with an unappealing hard-toughness. I know what you mean about granola often being chewy/gummy (yuck), but I'm strict about my granolas being light-crispy-crunchy AND easy to chew. Granola is perhaps the quintessential industrial food. It actually started that way and has remained ever since the early days of Kellogg. (Who stole the idea.) But every now and then, yesterday in fact, I picked up a box and almost bought it. It's candy of course. @Jennifer--Try spreading it thinner? I usually use two of the largest baking sheets that fit in my oven. The only other thing I can think of is that the particular strain of kefir I'm using might have a slight leavening effect, making it more tender. @Ken--That's just Google being Google. I have to demonstrate my humanity to comment on my own blog, too. Gummy? Gummy? That's horrifying. I make the easiest of granolas and it's so good, my oldest grandkid is begging for a whole big jar of it for his 13th birthday. I mean, this is a son of you-know-who, the foodie blogger, and he wants MY granola. The rolled oats might be your gumminess culprit--that and the flour. Quick oats, and skip the flour.